This is an amazing anime that I still cant believe that its so underrated. Mushishi is just as whimsical as Hayao Miyazaki's Totoro and Spirited Away, but a lot more mature. The anime is like a mix between Kino's Journey and xxxHolic. You follow one character through his various missions, which unravel dark and beautiful tales. The plot builds suspense and wonder in a very believable world, where spirits and humans coexist. It's hard to describe how good this anime is. You'll just have to watch an episode yourself to really know. It has been a little while since I have seen this. Maybe 2 years, but the lasting impression was that it was very good and gentle. The kind of program you would want to watch when life has made you feel a bit sensitive to all the turmoil in the world. Mushishi is in a category of its own. 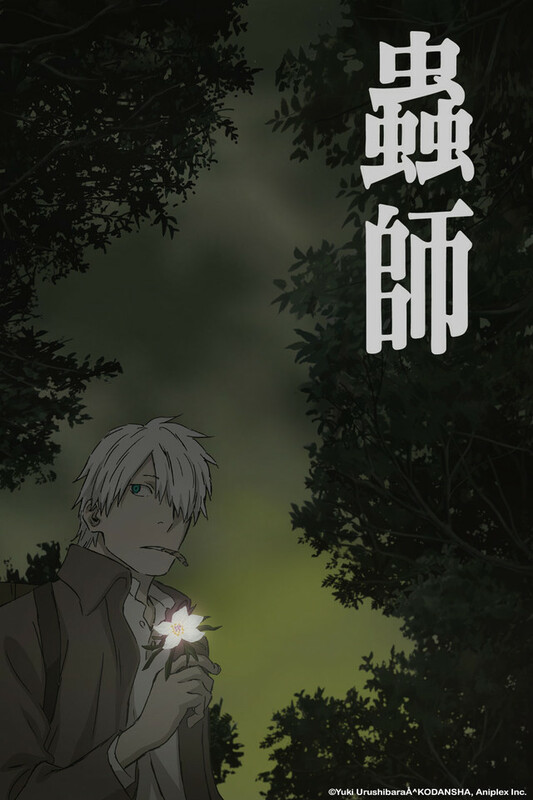 NOTE: The video streaming currently on Crunchyroll is an OVA of Mushishi. Before watching this, I recommend watching the original series, as many characters are ones that Ginko has treated in the original series. I have provided a link at the bottom of the review where you can watch the series with official subtitles. It's no joke to say that Mushisi is a masterpiece. However, it doesn't really fit into any of the standard anime genres (harem, shounen, etc. ), so it's hard to tell you whether you will like the show or not. You best bet is to watch 2-3 episodes, and if aren't hooked by then (which I can almost guarantee) then you won't be able to fully appreciate the awesomeness of Mushishi. Plot/Setting: The plot of Mushishi is mainly episodic. It's about creatures called Mushi, which are known as the purest forms of life. However, since, they are so pure, there are very few people who can actually see them. They come in many shapes and sizes, some even resembling humans. Ginko, the main character is one of them. He treats people who have problems concerning Mushi, and helps them. However, he always stresses that Mushi aren't evil; they are only trying to survive, like humans. Characters: Ginko, the main character is basically the only recurring character (aside from the medicine seller). His hair is completely white, and one of his eyes is missing (he has a fake eyeball). His real eyeball is green. The reason for his appearance, as well as his mysterious past, is revealed in the series. Art: The art for this series is simply beautiful. The scenery is all hand painted and looks alive. If you notice, most of the characters are plain and unmemorable (if that's a word). This is because the real art comes from the setting and the mushi. Sometimes it's nice to pause the video and see just how much detail is pu into the plants, animals, mushi and even the sky. Music: Although there aren't any memorable ost's, the peaceful music certainly fits the mood. OVA: The OVA shown here is also very good. Although it is nothing special, it sort of feels like another longer Mushishi episode, with the same stunning background art and peaceful soundtracks. In the beginning, it shows a flash of all the characters Ginko treated in the series, probably meaning that you should watch the series before watching this. Please note that the show airing here, on crunchyroll, is simply a 42-minute long special. I recommend watching it after watching all 25 episodes of the original. This is an OVA - it should not be the first thing you watch in the Mushi-shi franchise. There's no explanation of what "mushi" are, and that may confuse you if you're not familiar with the story. Check out the manga, or the first series (via Hulu, if you're in North America), then head back here. Mushi-shi is a quiet series that tends to slip under people's radar because it's very quiet and slow. There's no operatic music or action scenes to grab your attention. But that doesn't mean it's boring. It's beautifully animated, with minimalist but evocative music. The stories are simple - a mushi afflicts an individual or a village, and Ginko arrives to help - but each is different from the other in the way it affects their lives. This OVA is no exception, showing how the loss of sunlight after an eclipse affects not just a village but one particular girl and her family. This anime is so infectiously beautiful, I worry that it has cause a Mushi infection in my own eyes. This is the sort of series that can easily be used to spread the addiction of anime. The art is amazing, the story well told. Yet it is like any good storytelling, the events and phenomena that drive the story are not all that is in the story. The characters are real and dimensional, their problems, struggles and growth touch the viewer in ways that the standards of Sword and Sorcery, blasting Sci-Fi, or sappy Romance simply fail to do. Glad to have it back! We missed you Ginko! Eerily beautiful art and story. Extremely captivating anime with a beautiful story. It has wonderful art and soundtrack to match. Each episode tells a different eerie, and sometimes tragic tale. With realistic characters and an outstandingly deep plot, this anime is one of my favorites. I love this anime, even the Dubbed version! Even friends and family who don't like anime like this one. It's a fantastic story and journey. It's like exploring the mysteries of the world from a whole new perspective. I've been watching anime for the past 20 years, I highly recommend watching this one!! !